Delight, a registered Hanoverian gelding from the prestigious RCMP breeding program, will turn heads in the show ring with his expressive gaits and deep copper coat. Competing Training Level and schooling First Level with scores in the high sixties, this young gelding is a barn favourite, with his sweet and gentle personality. Delight is a fast learner, brave, very willing and smart. 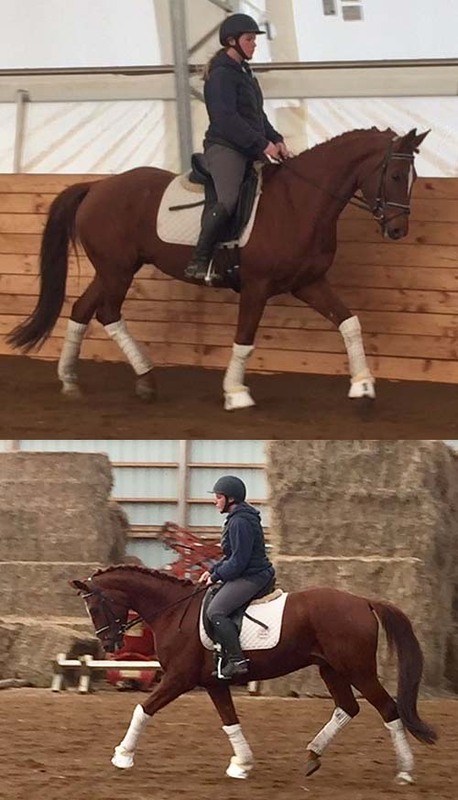 Delight has a super extended trot and a talent for lateral work. He is great in new locations and always willing to work. Delight is smooth to sit. He will make a great upper level dressage horse. Contact us today to meet Delight! Ready to compete Training Level and schooling First Level, this young gelding is a barn favourite, with his sweet and gentle personality. Delight is a fast learner, brave, very willing and smart. FOR SALE: Stunning 16.2 hh Gelding Boasting Exceptional Gaits *SOLD!